Are you wondering where computer gaming may go next? If you're Microsoft, the answer to that question is total immersion. A patent recently filed by Microsoft seeks to obtain dibs on a system that will project a gaming environment on all the surfaces surrounding the gamer. 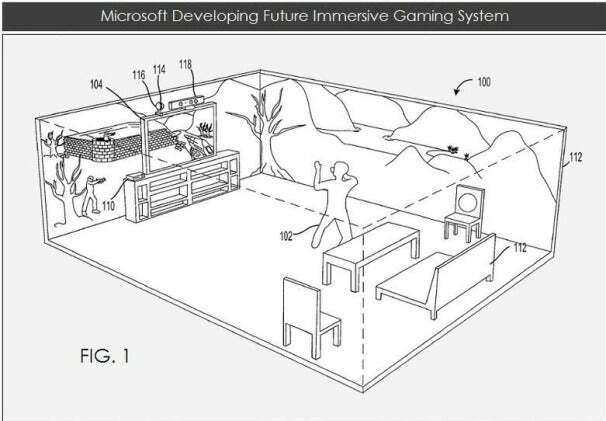 The patent reveals what Microsoft sees as the future of gaming beyond the introduction of the Xbox 720 next year, a future "which is simply wild!" according to Jack Purcher, of the Patently Apple website. Patently Apple usually confines itself to reporting on intellectual property developments for Apple but, apparently, this Microsoft patent was too good to pass up. "This could really be a hit with die-hard gamers and, with a little imagination, you quickly realize just how cool this could be," Purcher said of the Microsoft patent. In the system outlined in the patent, "An immersive display environment is provided to a human user by projecting a peripheral image onto environmental surfaces around the user. The peripheral images serve as an extension to a primary image displayed on a primary display." The system components include a game console, primary screen (HDTV), environmental display, and system-depth camera. Purcher explained that the environmental display, which sits on top of a TV with the depth camera, is a wide-angle RGB-projection display device configured to project a peripheral image in a 360-degree field around the environmental display. The peripheral images on the walls around the gamer are an extension of the game. So, with his peripheral vision, a player might see an enemy trying to outflank him before the foe appears on the primary screen. While the patent is illustrated with 2D images, Microsoft notes "it will be appreciated that suitable 3D displays may be used without departing from the scope of the invention." Incorporated into the environmental display is a user-tracking device, such as Microsoft's Kinect. "[G]estures performed by the gamer while playing a video game may be recognized and interpreted as game controls," Purcher explained. "In other words, Microsoft's Kinect will allow the gamer to control the game without the use of conventional, hand-held game controllers." The gaming industry has continuously tried to pump up the entertainment quotient of their products by making them more realistic, Purcher observed. The industry moved from 2D to 3D animation. It improved the resolution of game graphics. It pumped up sound effects and made game controllers more natural. Immersion is the next step in the evolutionary step in that development timeline. With game consoles from all the major makers in the latter half of their life cycles, they're all mulling over what the next generation of machines should bring to the table. Microsoft appears to have a solid vision for the future. Not only does it want its console to be the missing entertainment link in the living room—as the deals cut last year with Comcast and Verizon show—but to be the next big thing in gaming platforms—as it will be if it deliver on the ideas in this latest patent. "I could remember it being so dramatic when gaming shifted from the CRT to HDTV with 1080p," Purcher wrote. "Games came to life like never before. So the very thought that gaming will one day be able to immerse us into detailed gaming environments by projecting the imagery of the game onto the walls of our room is simply wild."